After this event, we learned that it was watched online with great interest, not only by Beja in Eastern Sudan, but apparently, by representatives of the National Congress Party government in Khartoum. The next day, they had their own “briefing” on Eastern Sudan. Needless to say, their conclusions were very different from our own. This does demonstrate the value of our advocacy, our media, our voices for peace, justice, and freedom in Sudan. Khartoum pays attention and is uncomfortable when we fail to play the usual appeasement game. It is quite a commentary about a country when one can refer to a previous genocide, and a current genocide, in order to distinguish them from yet another potential genocide taking place in the same country. And so, in speaking of Sudan, one can refer to the previous, unacknowledged genocide in South Sudan, Nuba Mountains, and Blue Nile, with the killing of over 2.5 million people and the displacement of over 5 million. One can refer to the current, acknowledged (in a moment of rare, startling, and quickly regretted frankness by the U.S. State Department) genocide taking place in Darfur. And one must distinguish these from the areas of potential genocide, such as is now taking place with the Beja in Eastern Sudan. 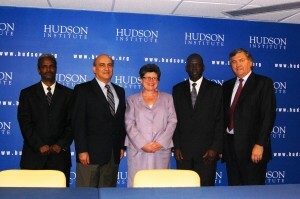 On Wednesday, April 27, 2011, The Institute on Religion and Democracy and The Hudson Institute’s Center for Religious Freedom co-sponsored a discussion on another of Sudan’s marginalized and oppressed people groups. “Eastern Sudan: Threats to the Beja People and Global Security,” focused on the indigenous black, African people of Sudan’s east, the Beja. Panelists at the discussion, held at The Hudson Institute, included Ibrahim Tahir Ahmed, a member of the Beja people group and co-leader of the Beja Congress, Washington, DC chapter; Dr. Walid Phares, author, analyst, advisor, and commentator on terrorism; Jimmy Mulla, president of advocacy group, Voices for Sudan; and Faith McDonnell, director of The IRD’s Religious Liberty Program and Church Alliance for a New Sudan. Dr. Paul Marshall of The Hudson Institute served as moderator. Ahmed spoke about the threats to the Beja people from the radical Islamist regime in Khartoum, and how the Beja are suffering under extreme poverty and lack of development, even though their land contains some of Sudan’s, and the world’s, richest resources. Now they are also being displaced from their ancestral lands. The Khartoum regime is giving the land of Beja to the Rashaida, a non-Sudanese Bedouin people. An analysis of the situation written by Beja Congress provides additional information. And an article by Faith McDonnell for Front Page Magazine, “Khartoum’s Next Jihad,” further explains the agenda of the National Islamic Front regime towards the Beja. The connection of Eastern Sudan to Islamic jihadists like Hamas and Hezbollah was explained by Dr. Walid Phares. Phares’ new book, The Coming Revolution: Struggle for Freedom in the Middle East, includes a chapter on Sudan. He explained that Khartoum is involved in “demographic modification,” another name for the ethnic cleansing by which Khartoum is attempting to eradicate the black, African identity of Sudan and give it an identity as an Arab Islamist country. He also talked about the Jihadi/Salafi activities of Khartoum that are focused on Port Sudan, including terrorist training camps, the movement of terrorists from Somalia and elsewhere through Port Sudan, the passage of weapons, and the use of the area during the Egyptian revolution to release terrorists. He also noted Eastern Sudan’s Iranian connections and influence. Faith McDonnell’s article “Hezbollah and Hamas: The Sudanese Connection,” in Front Page Magazine describes Sudan’s role in global terrorism. Finally, both Mulla and McDonnell stressed the need for advocacy for all of Sudan’s marginalized and oppressed people and for the Beja in particular. Mulla reminded the audience that because of the successful completion of the South Sudan Referendum, the U.S. government intends to “reward” Khartoum by lifting sanctions and removing the terrorist designation. He warned that this would be a serious mistake that Voices for Sudan would oppose. McDonnell echoed Mulla’s concerns, and called attention to a petition that the Beja Congress and friends of the Beja had created in order to urge Congress to encourage that U.S. Sudan policy include an acknowledgment of and support for the Beja as a marginalized people group in need of urgent humanitarian assistance. Please feel free to sign the petition and to forward it to others who may wish to sign. Sign the petition by the Beja Congress & Friends of the Beja to end the Sudanes Government’s human rights violation against the Beja of Eastern Sudan. A video of this event is available on the Hudson Institute website. We hope that by raising this cry, the Beja will be acknowledged as one of Sudan’s valuable indigenous people groups, with roots reaching back 6000 years, and that their culture will not be destroyed. This entry was posted in Activism, Beja, Central Sudan Government, International Support and tagged Beja, Eastern Sudan, Islamism, Khartoum, marginalization, racism. Bookmark the permalink.